I have a small brag to share. Stewie (Can. Ch. 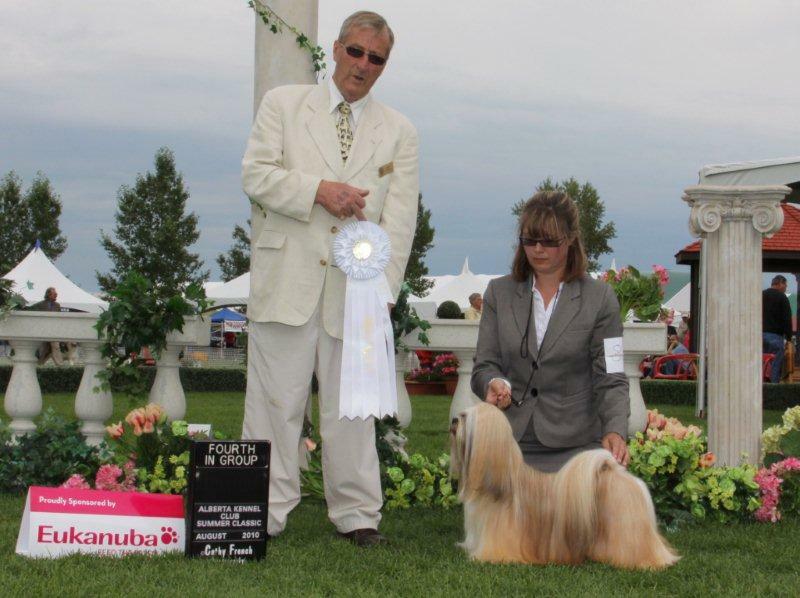 TillaRox Victory is Mine) and I went down to Calgary for four days of shows at the Alberta Kennel Club Summer Classic. We had a wonderful weekend winning the breed all 4 days – although today was a bit tight the judge was 45 minutes ahead of schedule and we just about missed the ring – it was a mad rush to get clips out, armband on, shoes changed, dog brushed and in the ring all in a matter of what felt like a few seconds all the while my heart felt like it was going to stop in my chest. But the icing on the cake was Sunday – we managed to snag a small piece of the group by placing 4th – it was a wonderful placement as it was his first group placement with me showing him and his first in a very tough group 6 – there are some really nice dogs out this way to duke it out against. This boy is a joy to show – you can’t tell there is anything on the end of the lead as he moves with such ease – he even makes me and my not so short legs run to keep up with him – he just hits the end of the lead and wants to keep going smooth as silk not a bounce or jolt to him he just “flows” as Shirley said on the weekend. I have to say though I am glad the weekend is done – it was humid (it’s never humid here) and nothing ever felt dry especially my suit jackets when I went to put them on – and hot and just plain gross – I’m a big fan of hot and dry this hot and wet stuff can go somewhere else.